The best tool to quickly analyze the long-term effects of different combinations of country and regional climate change mitigation proposals just got a little bit better. Just two months out from the next round of the international climate change negotiations, we’re releasing an updated version of the C-ROADS simulator. We’ve updated the data behind the model with the latest available and are giving users even more graphs and controls, along with resolving a few bugs to help you out. If you have yet to get behind the controls of this powerful simulator you can request a download on Climate Interactive’s website. If you would like to update your version of C-ROADS just login and navigate to the download page. Read below for all the details of the changes we’ve made or watch our latest tutorial video to walk you through the changes. We have added graphs for CO2 equivalent emissions by country and global to the “CO2 Equiv” graph menu and have relocated “Forestry Net Emissions by Country” graph from the “Land Use” menu to the “CO2 Equiv” menu to follow the general rule that the graphs on the left are more emissions related and the graphs on the right are more results- or impact-related. Three new graphs are also present in the right graph pane under the menu “GHG concs”, which was formerly labeled “CO2 & CO2e”. These are for the atmospheric concentrations of CH4, N2O, and atmospheric CO2e and the user specified goal for CO2e. The goal for CO2e is set on the “Settings” pane using the “Atmospheric CO2e Goal” controls. 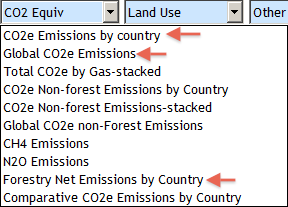 When a country/bloc is set for Manual, Excel, or Graphical input, the table cells representing it in the World Climate input table are disabled for input and grayed. In the example shown in the figure, both the US 6R and India 6R are set to Manual or Excel input respectively and their respective rows are disabled. The settings for Deforestation for the US, EU, and China are always disabled and grayed out. The remaining forestry inputs are either displayed as in the figure when WCE Forestry inputs are active or are grayed/disabled when Land-use Forestry inputs are active. Inputs to table cells are prevented when the cells are disabled. Boden, T.A., G. Marland, and R.J. Andres. 2011. Global, Regional, and National Fossil-Fuel CO2 Emissions. Carbon Dioxide Information Analysis Center, Oak Ridge National Laboratory, U.S. Department of Energy, Oak Ridge, Tenn., U.S.A. doi 10.3334/CDIAC/00001_V2011, cdiac.ornl.gov/ftp/ndp030/CSV-FILES/nation.1751_2008.csv. The changes in the emissions of other GHGs are due to the more complete national data released by EDGAR 4.2. Before this update, CH4, and N2O data relied on allocation between countries consistent with data by MIT’s Joint Program on the Science and Policy of Global Change (JPSPGC) Technical Note No. 8 (2006) but scaled to the global emissions provided by Stern and Kaufmann (1998) for CH4 and EDGAR-HYDE 1.4 (Van Aardenne et al., 2001, adjusted to Olivier and Berdowki, 2001) for N2O emission data. Those data spanned through 1995. Similarly, MIT’s JPSPGC Technical Note 8 (Asadoorian et al., 2006) provides the historical emissions for PFCs and SF6 by country. HFCs are considered as nine of the predominant individual HFC gases. The historical data for HFCs were based on MIT’s JPSPGC Technical Note 8 (Asadoorian et al., 2006) HFC-134a equivalent emissions, which were allocated between the different HFC types according to the ratio of the different types at the earliest year of A1FI projections, i.e., in the year 2000. Now, EDGAR 4.2 provides the historical emissions from 1970-2008 of CH4, N2O, and F-gases (including PFCs, SF6, and the nine predominant HFC types). Pre-1970s data still relies on the former methodology. Globally, the results are fairly consistent except for N2O, which is approximately 17% less for the EDGAR 4.2 data than it was using the global data by EDGAR-HYDE 1.4 (Van Aardenne et al., 2001, adjusted to Olivier and Berdowki, 2001). The evaluations of Reference Scenarios as determined from downscaling using the updated and more reliable historical data reveal that in many cases the regional consistency with SRES and EMF regions is indeed improved. However, there are also many cases where it appeared better and the bridge from historical to projected emissions was smoother when we used the less complete data, which relied on more assumptions including filling in the gap of years between 1995 through 2010 using those models’ projections. However, SRES and EMF projections were generated before the data occurred, and history has not always been consistent with those projections. Our task in downscaling from those models has been to accurately reflect history with the best available data and bridge those with the SRES/EMF projections. The population projections under the alternate Reference Scenario have been slightly updated to reflect a few corrections in the regional assignment of countries listed by the United Nations, the source of the alternate population reference scenario. In the 6-region aggregation, when changing one country/bloc to World Climate inputs, the Forestry/Land Use inputs were also changing the to World Climate mode. This has been decoupled so that Forestry/Land Use inputs must be explicitly changed to World Climate mode if desired. The exception to this occurs when the “World Climate Setup” button on the Welcome/Main screen is clicked which sets all regions to World Climate as well as sets the Forestry/Land Use inputs for World Climate. We also corrected a labeling error in the y-axis label on graphs for Cumulative Fossil Fuel CO2 from PPM to GTon CO2in the Contribution Analysis. 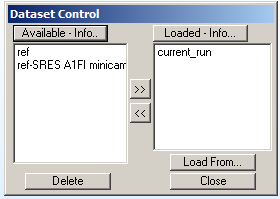 When the Dataset Control dialog is dismissed, C-ROADS remains the active window. Whenever the current_run is not active, there is a message to that effect displayed below the graph legends and below the control panel. The “Settings” tab was not active when C-ROADS was used in “Review Run(s)” mode preventing access to the Set X-axis for Graphs feature that allows changing the x-axis. 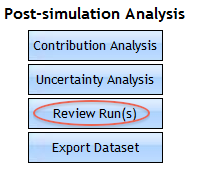 This has been corrected and the x-axis may be changed in “Review Run(s)”, “Load Saved Run”, and “Create New Run” modes. There is a reminder message at the bottom of the control area to guide the user back to the current run when desired.